What’s your favourite time of year? Some love the tantalizing flirtatiousness of spring, others the voluptuousness of summer days and for some it’s the crisp, frosty cold of winter. For me it’s always been autumn, with its vibrant colour, abundant produce, luminous light and the surprise of warm sunshine in between the rain and mist. With the Lake District on my doorstep, I take every opportunity to go LEAF-PEEPING (yes, that’s what it’s called in North America). 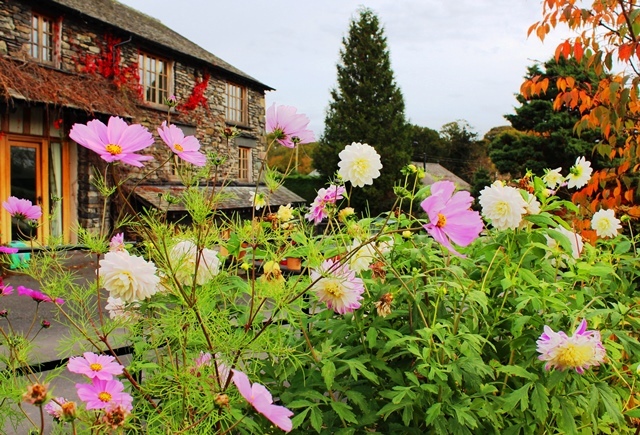 On a recent stay at Knipefold Barn, near Hawkshead, I had the chance to experience early autumn colour in the Lake District. 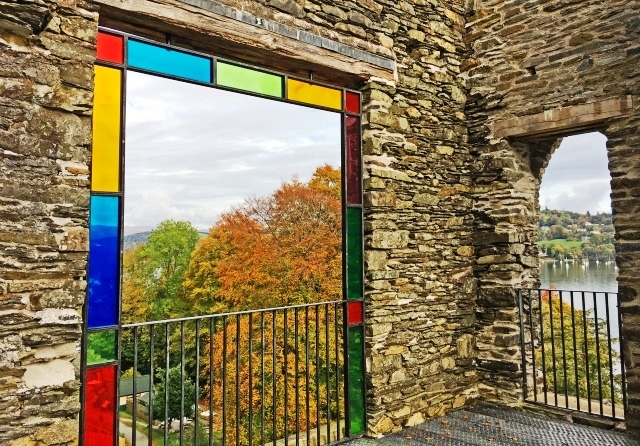 The view from the top of Windermere at Waterhead, near Ambleside is sublime any time of year, but in autumn those huge trees that line the road, turn every shade of the rainbow. 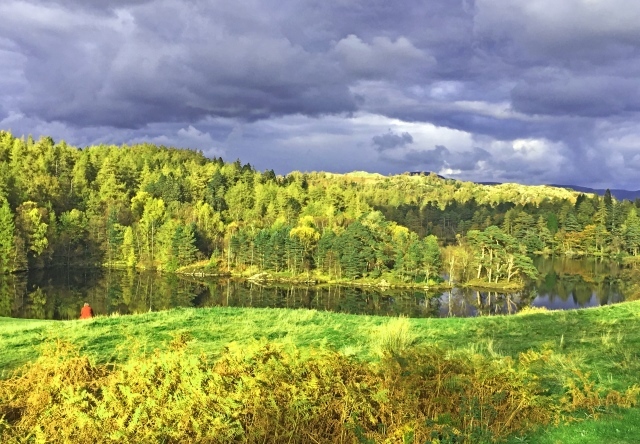 Across the lake, towards Brathay, you can see more trees, pushing each other out of the way to show off their coats of many colours. It’s a very popular place to stop to enjoy the view. I was there over half-term and there were plenty of children paddling in the water plus a group of students learning how to canoe. Pop into one of the hotels on the shore for a meal or grab a hot drink from one of the cafes nearby. Walk along the road past the lake to find the rather uninspiring, but very important ruins of Galava Roman Fort. The circular route is suitable for all access with relatively small inclines. You can borrow a Tramper from the National Trust office in the car park if they are open. 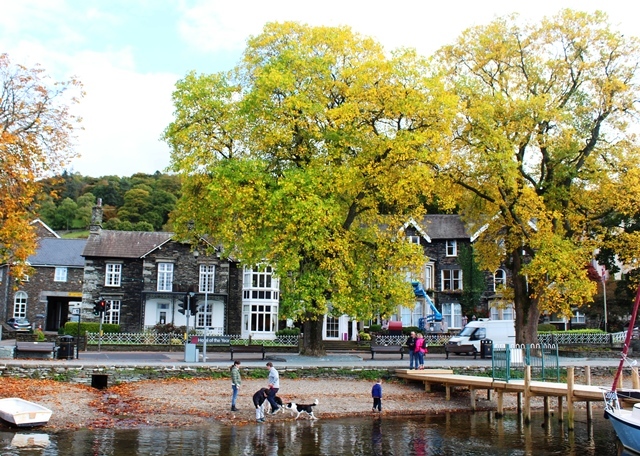 This new addition the Lake District attractions, is a brilliant place to view autumn colour all around Windermere. 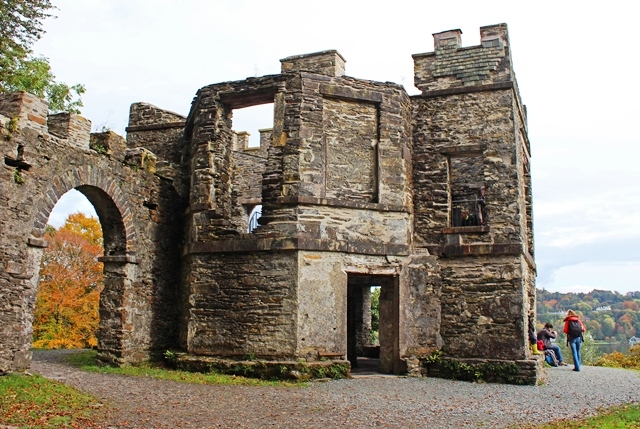 Claife Viewing Station, built in the 1790s, was designed to showcase the glorious views of the lake from its west shore and the surrounding countryside, using tinted windows to ‘enhance’ the experience. ‘Yellow created a summer landscape, orange an autumn one, light green for spring, dark blue for moonlight …’ The National Trust has restored the ruins and visitors can now experience this unique place for free all year round. It was a real pleasure to gaze out across the lake, admire the the trees turning colour and feel a part of local history. 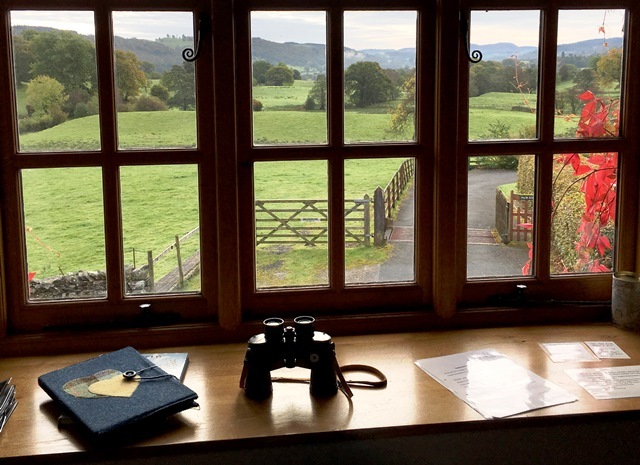 There are barn conversions, and then there is Knipefold Barn, one of The Good Life Cottage Company’s many charming properties in the Lake District. This 3-bedroom self-catering accommodation is built to the highest specification. From the Lakeland slate floor in the entrance hall, to the top-of-the range kitchen and bathroom fittings and elegant wooden staircase, this place has got luxury written into its ancient walls. Set in a tiny hamlet, a short distance from Outgate and only 5 minutes’ drive from popular Hawkshead, Knipefold Barn has all the comforts of home, and then some. I loved the enormous oak-beamed living area, situated on the top floor, to make the most of the view. It sleeps 5 and would be the perfect place for a family holiday, celebration or friends get-together. You can see more in this Quirky Travel Guide to Knipefold Barn. 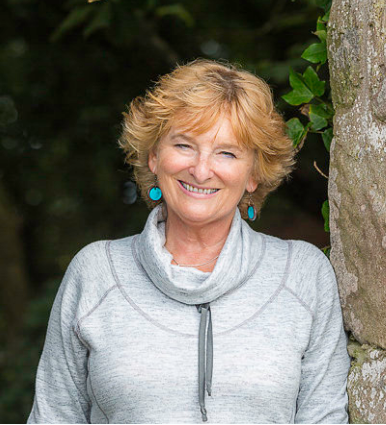 Many thanks to Natalie, manager of The Good Life Cottage Company, for her warm welcome and providing the ideal place from which to explore the delightful autumn colours of this part of Lakeland. 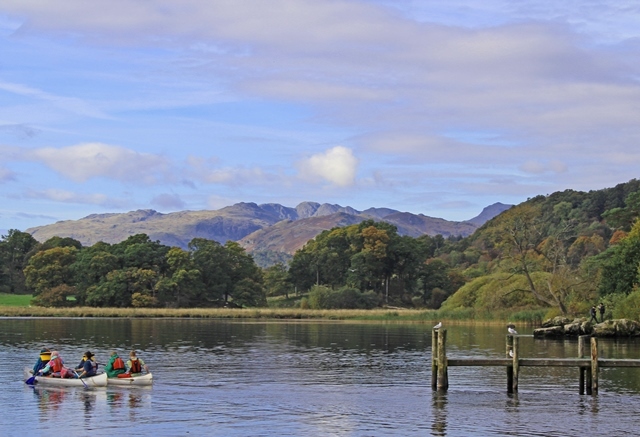 Autumn is a very popular time to visit the Lake District so if you want to ensure you get a particular property, hotel or B&B book as early as you can. However, there are always last minute bargains to be had ???? We’ve certainly had a really good October John. Hope it continues into November – and you can carry on working outdoors! 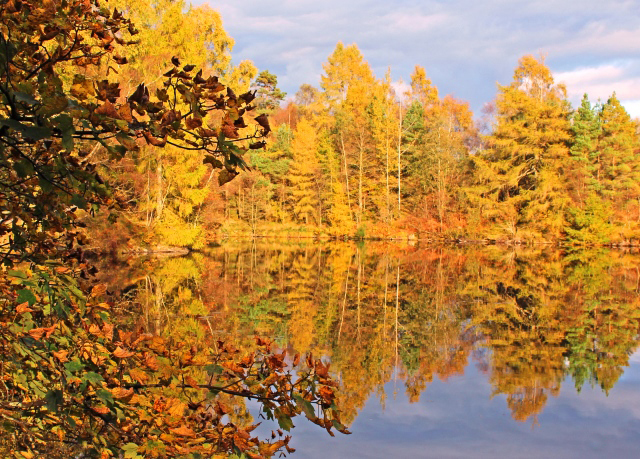 We love the video, photos and account of your stay with us this Autumn! Knipefold Barn is a beautiful self catering holiday cottage. We have lots more lovely properties to choose from too! I’ve not been in to the Lakes for a while and considering it’s on my doorstep that’s really bad. October was a fantastic month, full of sunshine to show off those colours, it really is spectacular. Next time I go I should stay over so I shall check out Knipefold Barn and similar places, thanks for the tip. 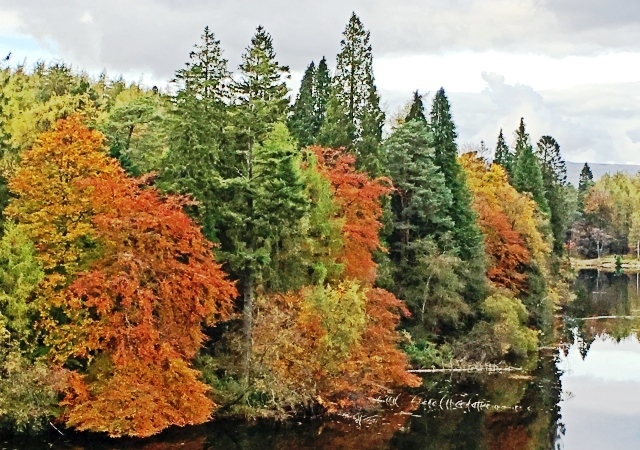 Thanks Marianne – as you say, a lovely time of year and Tarn Hows is one of the very best places to see all that autumn vibrancy. Oh Becky – get back there right away! Still time to catch the last of the autumn colour 🙂 Knipefold would be a fab place to stay with a group of mates – great venue for relaxing with friends and family.